Yuma has the lowest elevation of any city in Arizona at just 134 feet, and is one of the hottest, sunniest and driest places in the whole US, surrounded by irrigated land beside the Colorado River in the far southwest of the state, 16 miles from the Mexican border. Interstate 8 runs along the northern edge, heading east and west across barren deserts, the nearest major cities being Casa Grande (177 miles) and El Centro in California (61 miles). The original downtown area of Yuma is right beside the river, but this is now mostly residential, with just a few small businesses remaining, and several historic sites like Yuma Territorial Prison and Yuma Quartermaster Depot. 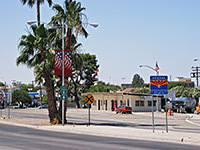 Instead, the city's many shops, restaurants and hotels are spread out along the main roads, mostly 4th Avenue, 32nd Street and 16th Street, and beside the interstate; the main location is either side of exit 2, centered on Yuma Palms Shopping Center. The city boundaries extend over 12 miles from east to west, and include a smaller shopping/logding area around exit 12 of the interstate (Fortuna Road). The recently buit Holiday Inn hotel in Yuma occupies a quiet, spacious site just off exit 2 of I-8, 2 blocks from the Yuma Palms Shopping Center, and 3 miles from both the downtown area and Yuma International Airport - part of a group of other hotels built right at the edge of town, with farmland to the east and the wide, meandering Colorado River 2 miles north. The Holiday Inn is a large, full service, all non-smoking establishment with 121 rooms on 4 floors, an on-site restaurant/lounge, convenience store, fitness center, large outdoor pool, and various facilities for business & meetings. It has particularly efficient, friendly staff and is regarded by many as the top hotel in Yuma. The recently built Homewood Suites by Hilton caters for extended stay visitors to Yuma, offering 108 two bed, one bed or studio suites, all very spacious, and equipped with a kitchen that includes a full size refrigerator and 2-ring stove - part of a large, elegant building at the intersection of Pacific Avenue and 16th Street (US 95, the main route into Yuma from the north). The international airport is 2 miles south, and the city center is 3 miles northwest. Complimentary amenities include internet access, daily hot breakfast and evening receptions (Mon to Thu), where snacks, beer and wine are served. Leisure amenities are a putting green, plus the usual fitness center, outdoor pool and hot tub. A business center and a 100 person meeting room cater for those here to work. Hilton Garden Inn is the northernmost hotel in Yuma, and it has a scenic setting overlooking the Colorado River, accessed from I-8 exit 172, just over the border in California. 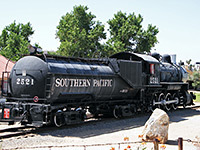 The hotel is adjacent to Pivot Point Conference Center, Gateway Park along the Colorado, and Yuma Quartermaster Depot State Historic Park, which preserves a historic army outpost. The on-site Great American Grill restaurant is open for breakfast, lunch, dinner & room service, the Pavilion Lounge serves evening drinks, while snacks and light meals (cookable using the in-room microwaves) can be purchased from the Pavilion Pantry convenience store. An outdoor pool and sundeck are located on the sunny south side of the property. Yuma's Hampton Inn provides the closest lodging to the Yuma Palms Shopping Center, located just across the main road on the south side, near the 16th Street (US 95) exit of I-8. Over a dozen restaurants are within easy walking distance, and free hot breakfast is available on site, with a take-out version for guests leaving early. The hotel is quite large, with four floors and 90 rooms, all equipped with a microwave/refrigerator; there are also a selection of suites (one bed or studio). Guests can take advantage of all usual facilities for leisure, business and meetings. The TownePlace Suites is a clean, new, welcoming establishment - a 4 floor building containing 81 two-bedroom, one-bedroom or studio suites, aimed primarily at the extended stay market. All rooms have a full kitchen complete with dishwasher, oven, microwave and refrigerator, food for which can be purchased from the Yuma Palms Shopping Center one block north. For recreation guests have use of a fitness center and an outdoor pool/hot tub. Breakfast is complimentary, as are the receptions on selected weekday evenings. The hotel's 486 sq ft meeting room can accommodate 25 people. The TownePlace Suites has a quiet location near the east edge of town, part of a Marriott complex that also includes the Fairfield Inn and SpringHill Suites. Long stay visitors to Yuma are well catered for by the SpringHill Suites hotel, a modern, new-looking building just east of interstate 8 exit 2, next to another Marriott property (Fairfield Inn). The hotel has 80 studio suites, all with a mini kitchen containing refrigerator, microwave & sink; top floor rooms have far reaching views over the desert towards distant mountains. At the rear is a courtyard area with pool & hot tub, while interior facilities are an exercise room, coin-operated laundry, two meeting rooms (maximum capacity 100) and a dining area where free deluxe continental breakfast is served each morning. Both hot breakfast each morning and evening receptions (Mon-Thu) are complimentary at Wingate by Wyndham Yuma, while other meals can be purchased from two adjacent restaurants. The hotel is built on the north side of I-8 in a lightly developed area, a short walk from Yuma Palms Regional Center and 2 miles from the international airport. Amenities include a 24 hour business center, meeting space, laundry, a convenience store and a secluded outdoor pool, at the rear of the property. Holiday Inn Express Hotel & Suites Yuma is the easternmost hotel in town, built on farmland at the north side of I-8 exit 3 along Avenue 3E, a road which leads directly to Yuma International Airport and the US Marine Air Corps Station, 2.5 miles south. Nice (free) breakfast is served, including several hot items, and for other meals there are plenty of restaurants within a mile, towards the Yuma Palms Shopping Center. The 4 floor, pet friendly hotel has 120 large extra clean rooms, an outdoor pool, hot tub, fitness center, business center, and meeting facilities catering for up to 140 guests. A third InterContinental Hotels Group property in Yuma opened its doors in 2007, right next to a sister hotel (Holiday Inn Express) at the east edge of the city beside I-8. Candlewood Suites Yuma has 95 modern suites furnished with an executive work desk, LCD TV, DVD player, and a full kitchen that includes a stove, dishwasher, refrigerator/ice maker, and a microwave. Snacks and food items for cooking can be bought from the on-site convenience store, or guests can eat at one of over 20 restaurants at the Yuma Palms Regional Center, two miles west. There is one restaurant adjacent. Other facilities for extended stays include guest laundry, a (free) DVD library, and a barbecue area with gazebo. For leisure, the Candlewood Suites offers a fitness center and sports court, though no pool. A free shuttle is operated to places within 5 miles, including Yuma International Airport. Best Western InnSuites Hotel is reached from exit 2 of I-8, in east Yuma - one block east on 16th Street (US 95) then a short distance north on Castle Dome Avenue. There are 166 good sized rooms at the hotel, including a range of suites offering different levels of amenities, together with a landscaped outdoor pool, sun deck, spa, tennis courts, exercise room, bar/cafe and meetings facilities. Quality free hot breakfast is provided, plus a free afternoon reception. The Yuma Palms Shopping Center on the other side of the road has the best choice of restaurants and shops in town. One of several hotels next to exit 2 of I-8 (east side), Fairfield Inn Yuma has a good reputation for comfortable rooms, friendly staff and above average free continental breakfast. The inn is 2 miles from the downtown area, 2 blocks south of the largest shopping mall in Yuma, and within 1/4 mile of several restaurants including Denny's. All 64 rooms contain a refrigerator, though no microwave; other hotel amenities are an outdoor pool, whirlpool, newsstand and guest laundry. 79 room Comfort Inn & Suites Yuma enjoys sweeping views over the desert and the nearby Gila Mountains - the hotel is built next to exit 12 of interstate 8 near the village of Fortuna, ten miles east of Yuma. The road past the hotel links with US 95 which heads due north, reaching Kofa National Wildlife Refue after 40 miles. The inn is a quiet, reasonably-priced and well managed establishment, offering an outdoor pool, fitness center, and free continental breakfast. There are several restaurants within walking distance, though most other facilities are at least 6 miles away, close to Yuma. Yuma's Quality Inn hotel is located just southwest of exit 2 of interstate 8 in a business/commercial neighborhood, just off 16th Street, about half way between downtown Yuma and the international airport. Like most hotels in the city, the Comfort Inn has an outdoor pool, surrounded by trees at the rear of the property, away from the access road. Also available are a fitness center, sundeck, laundry and basic business services. Breakfast is complimentary. The 81 rooms are clean and recently renovated, and while not luxurious, the hotel is a good choice for mid range accommodation. There are two adjacent fast food restaurants. Along the main road through south Yuma (32nd Street), the Ramada hotel has an attractive setting surrounded by many tall palm trees, set back a way from the highway, and overlooking a sheltered, landscaped garden area containing the swimming pool. There are 80 rooms, all with microwave & refrigerator, plus several kitchenette suites that can accommodate up to six guests. Pets are welcome in some of the rooms. The inn has its own restaurant, open for breakfast & dinner, and there are many other dining places within 2 blocks both east and west. The airport is a short distance southeast (a 3 mile drive to the terminal), while on the other side of the highway are the greens and fairways of Yuma Golf & County Club. Yuma's Howard Johnson Inn is built along 4th Avenue just where the road curves to the east and becomes 32nd Street, adjacent to several large stores including Sears, Lowe's and Albertson's - a busy, urban neighborhood though close to the greens and fairways of Yuma Country Club. The international airport is 1.5 miles east. The motel is shielded from the main road by a lawn and a belt of trees; it has a pleasant outdoor pool at the front and ample parking space all around. Rooms are on two floors, accessed by exterior corridors. The free breakfast includes a few hot items. The pet friendly Microtel Inn is one of a small number of hotels near the east edge of Yuma at I-8 exit 12, beside a shopping center with a good selection of fast food restaurants. The place is quite small, with 56 rooms, some enjoying views over the outdoor pool & hot tub, lined by a few palm trees. Regular rooms are available, plus a selection of suites with kitchenette and sofa bed; some have a whirlpool bath. Free continental breakfast is prepared each morning. Baymont Yuma (formerly Oak Tree Inn) is part of the large group of hotels on the north side of Interstate 8 near the US 95 intersection, within walking distance of a good choice of shopping and dining outlets. The 119 guest rooms are divided between three buildings, all of two floors and interior corridors, surrounded by the tree-lined parking lot, and bordering undeveloped land to the rear. The grounds also include a secluded outdoor pool and a 24 hour diner/restaurant. Wi-fi and airport transportation are complimentary. Pets are welcome. Days Inn Yuma is a part of the main commercial area in the city, centered on Yuma Palms Mall; there are many shops, restaurants & bars nearby, plus a movie theater. 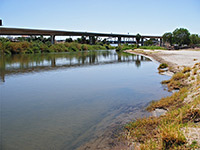 I-8 runs right past to the west, 2 miles from the California stateline; access is from the 16th Street exit. The inn offers budget-priced, exterior corridor accommodation, with amenities of a meeting room, outdoor pool/hot tub, business center and coin-operated laundry. All guest rooms have a microwave and refrigerator. Free continental breakfast is provided. Guest rooms at Econo Lodge Yuma are contained within a two story, exterior corridor, L-shaped building on the east side of 4th Avenue, close to several restaurants and shops, and the local post office; the nearest I-8 exit (16th Street) is 1.5 miles away. The usual two complimentary amenities of wi-fi and breakfast are provided, while the motel also offers an outdoor pool and basic business services. A refrigerator and microwave are installed in all accommodations. Super 8 Yuma is part of a small group of hotels and restaurants on the west side of I-8 at the 16th Street exit, far enough away (0.3 miles) from the interstate to avoid the traffic noise. There are 82 guest rooms available, contained within a relatively old three floor building with interior corridors, surrounded on three sides by the parking lot. An outdoor pool and hot tub are tucked away at the rear, shielded from the access road. Continental breakfast and wi-fi are provided free of charge. Right beside I-8 at the 16th Street exit, Motel 6 Yuma East is a welcoming, low price, limited amenity property of 122 rooms, some of which overlook the outdoor pool and small garden area. Guests are a short walk from Yuma Palms Regional Center, the largest shopping complex in southwest Arizona; there are many restaurants nearby and one (Denny's) adjacent. The motel provides free coffee and wi-fi. Pets are welcome.